Okay, so it has been all about bacon in recent months. Donuts. Martinis. Dipped in chocolate. And while we're not ready to forsake those salty-licious strips just yet, we've been wondering what meat-based product we might be sipping or dipping or scrubbing our bodies with by the close of '09. Our early vote? Probably Spam. 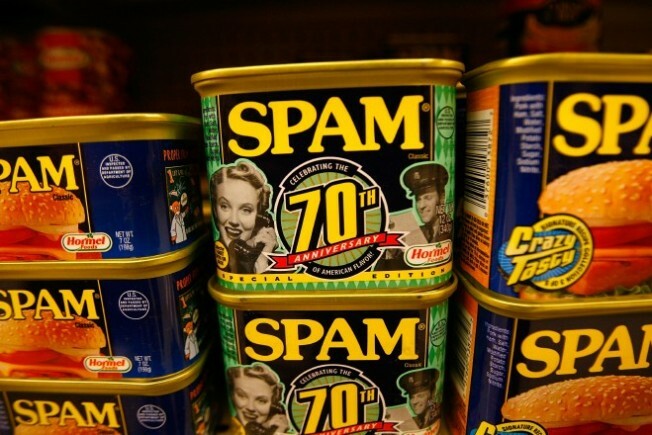 Beside being the most famous of the potted meats -- two of our favorite words to say together, potted meats -- Spam is known for being a friend to the plate during harder times. This was pondered upon in no less than the New York Times recently, and, with a few pals recommending different ways to fry the stuff up, we stand intrigued. Especially about its well-known abilities to stretch the grocery budget. Our grocery budget? Gone by the time we walk in the door and grab our cart. How does that even happen? So, it is tasty. It's huge in Hawaii (and our president-elect snacked on it over the holidays). It lasts and lasts. But at the end of 2009, will Spam be *the* meat of the year? Will we be brushing our teeth with it? Polishing our cars? Wearing tiny little Spam hats? That's where bacon stands now -- it has risen far and above the lowly frying pan -- and we just want to know if there's a meat product out there that can unseat -- unpan? -- the savory, streaky, oh-so-good-with-eggs darling of 2008.